Represented by imagery and emotion through his global sound, JSTJR has earned himself releases on some of the top music labels such as Mad Decent, Fool’s Gold, Insomniac and SMOG. The 27-year-old DJ has forged a love for regional sounds from around the world with his inherent tendencies for hip hop and experimental electronic production. This unique, hybrid and inclusive approach to dance music has earned him recognition from other popular producers in the scene including Skrillex, A-Trak, Dillon Francis, GTA and Diplo. The New England-native has spread his Moombahton and unique global bass sounds across America, Australia, China and India, touring nationwide and playing some of the biggest festivals in North America. 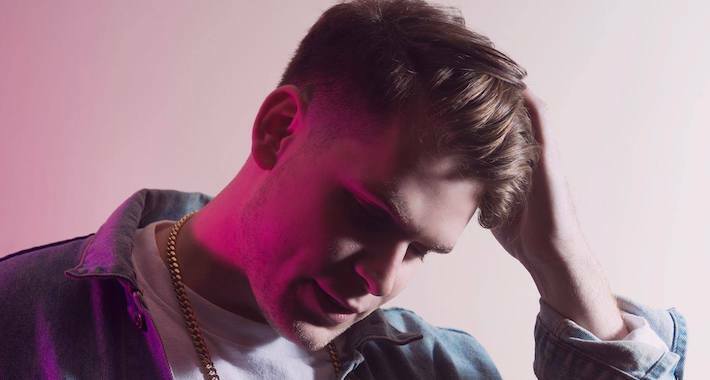 JSTJR filled his 2018 with international hits and collaborations, and now has his sights on his new record label, called Group Chat, where he dropped his EP, El Culo,incorporating a blend of EDM, Latin Pop and Moombahton. If you didn’t get enough of JSTJR during his performance on December 14th at Bassmnt or didn’t get to catch his giant mashup performance, we caught up with the DJ/producer to see what’s in store for the upcoming year. Tell us a little about your background and how you got started DJ/producing music? I’ve always been into music, I started playing piano on my own as a kid and then got a drum set when I was in 2nd grade. I’ve played in a lot of different bands and made all types of music on my own. I started producing on the computer with a bootleg copy of FL Studio when I was 13, but really dug into electronic music as “JSTJR” about 6 years ago. Who are some of your musical influences? Someone you look up to? I’m influenced by a lot of different music. I have a degree in classical music and have been digging deep into club and underground music worldwide for the last decade or so. I will say Diplo and Major Lazer played a big role in how I’ve developed as a DJ and producer. Also, from an early age, M.I.A. got me interested in different styles from around the world. I find a lot of inspiration in the weird underground stuff! I’d like to work with some reggaeton OG’s like Daddy Yankee and Don Omar. And El Chombo. ALSO M.I.A. You’ve been pushing more Moombahton and your own unique bass sound in your tracks such as “Culo Pa Tra,” what inspired you to go that route and fuse the two sounds rather than pushing out the usual bass/trap track? I always strive to be different. I don’t think there’s any true artistic reason to make a track that sounds like everyone else. It’s self-indulgent. I want to push boundaries in dance music. Reggaeton and moombahton have always been some of my favorite genres so it’s been super natural for me to continue working on these sounds and making them my own. I like making people DANCE so the more of that, the better. You also just released your own label, Group Chat. Can you tell us more about that and what the future holds for the label? Just like the last answer, I want to push boundaries and allow for artists to do something different. Not like, “weird” different, but just different than the over-saturated bass music we hear coming out lately. That’ll focus on a lot of global bass sounds, but I plan to release anything that I think is cool and refreshing but still makes you dance! You’ve played EDC Las Vegas, and now just played for Bassrush on Friday at Bassmnt. For those who have never seen you perform live, what can they expect from your set? My sets are like one giant mashup. I play almost every genre, a lot of throwbacks mixed in, and like to keep the crowd on their toes (and dancing). I go from hip hop to dubstep to reggaeton all in a few minutes. It’s a lot of fun and hard to stop moving. What are some upcoming projects or collaborations that you’re working on that fans can look forward to next? Anything exciting planned for 2019? I’ve got lots of cool new music on the way and some dope releases from my friends on Group Chat. Going to keep up what I’ve been doing this last year with parties and community events and build the culture even stronger! Tell us 5 things we don’t know about you. I have a degree in classical percussion. I used to make rap music and hip hop beats before DJing. I was going to school for film before switching to music. I spend most of my listening time on talk radio and audiobooks. I love history and a lot of other nerdy stuff and not much of a party animal (unless I’m DJing haha).